Once Amir was diagnosed with bipolar disorder, he was eager to understand this brain disorder that causes unusual shifts in mood, energy and activity levels. 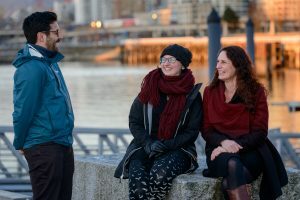 He didn’t need to look any further than Vancouver to find Dr. Erin Michalak, network leader of CREST.BD, a team that studies psychosocial issues in bipolar disorder with youth ages 15 to 22. Dr. Michalak, a Djavad Mowafaghian Centre for Brain Health researcher, quickly recognized Amir’s talents and involved him in making a video about how people with bipolar disorder manage school. Before long, he was interviewing scientists at the largest annual bipolar conference and posting what he learned from them on social media. Left to right: Amir, Natasha, and Dr. Erin Michalak. Dr. Michalak’s goal is to help people with bipolar disorder improve their own health and wellness, and she makes it happen by engaging them in research and knowledge exchange. “One of the secrets to success is adapting the way we work together according to where each person is at and where they’re going,” says Dr. Michalak. Natasha met Dr. Michalak when she was an undergraduate student in psychology at UBC. She got involved with CREST.BD by posting research results for a wide audience on social media and went on to develop the project’s blog (www.crestbd.ca/blog).